Derwent Water isn’t the biggest of the lakes in the Lake District but is certainly one of the prettiest. One of the best ways to enjoy the fantastic scenery here is to take a boat trip on the Keswick Launch ferry. The main landing stage is located just a short walk from Keswick town centre, close to Crow Park and the Theatre by the Lake. In the summer season (late March to mid-November) boats depart every thirty minutes throughout the day. The route alternates between clockwise and anti-clockwise around the lake, calling at Ashness Gate, Lodore, High Brandelhow, Low Brandelhow, Hawse End, and Nichol End. A reduced ferry service runs in the winter months. For a full timetable visit the official Keswick Launch website. The full trip around the lake lasts 50 minutes and costs £9 for adults and £4.50 for children (5 – 15). Under 5’s enjoy a free cruise. Passengers are free to hop on and off the ferry at any of the stops and pick up a later boat back to Keswick. Single fares to any of the stops are also available. The walk from Hawes End to Lodore is popular with many passengers. 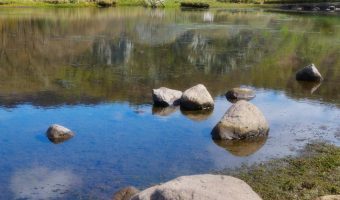 The easy 5 mile route runs through the oak woods of Brandelhow, Manesty Park, over the River Derwent via the Chinese Bridge, before ending at Lodore. Here passengers can view the magnificent Lodore Falls or get a drink and something to eat at the Lodore Falls Hotel before catching the boat back to Keswick. In the summer months evening cruises are also available. They last for one hour and include commentary and a complimentary glass of wine or soft drink. 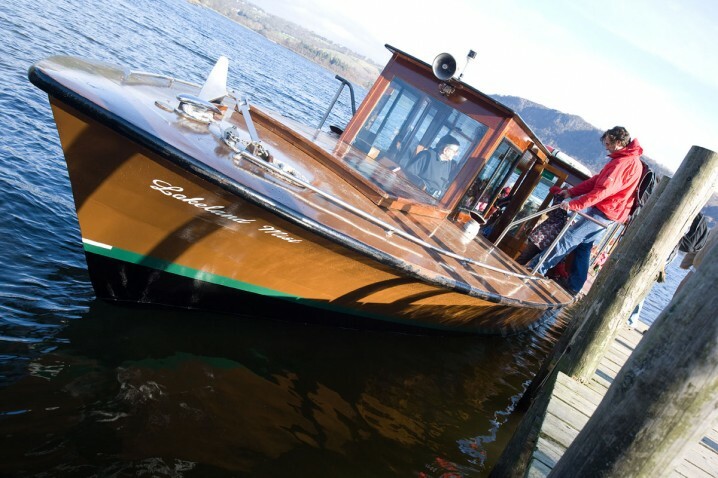 The company also hires out rowing boats and cabin cruisers from the Keswick landing stage. Keswick Launch is situated at the bottom of Lake Road, just outside Keswick town centre and easily reached from there on foot. The nearest car park is Allerdale Borough Council’s Lakeside Car Park, a pay-and-display car park on Lake Road, adjacent to the Theatre by the Lake (postcode CA12 5DJ). Map showing location of Keswick Launch. It’s a very nice cruise. They don’t mind you hopping on and off. So you can get off and have a walk around and then wait for the next boat to come along. To reach Keswick Launch you can walk from the town to the lake via Hope Park. It’s a very charming park with a miniature golf course and attractive gardens. It’s very pleasant indeed. You’ll also pass the Theatre of the Lake. 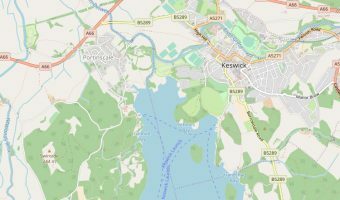 Interactive map of Keswick. Shows the precise locations of hotels, tourist attractions, and other points of interest. 5-day weather forecast for Keswick. View temperature, wind speed and chance of rain. One of the best loved lakes in the Lake District.